CLICK HERE TO GO TO THE PILOT CHAPTER! 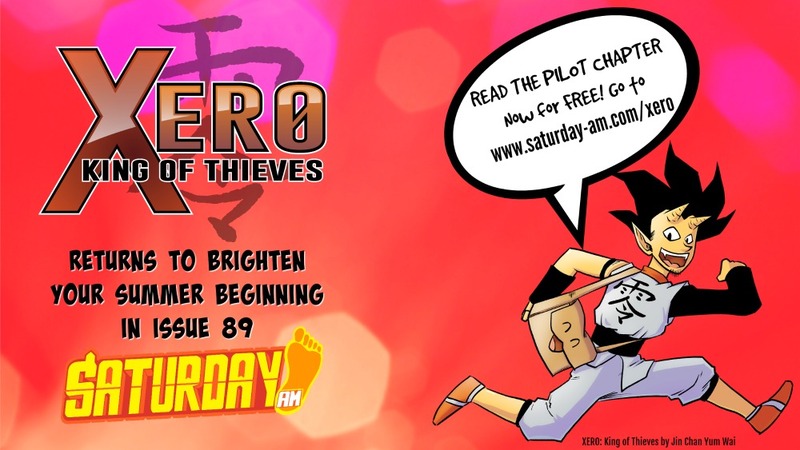 XERO: King of Thieves was a HIT when it debuted as a single PILOT Chapter from the extraordinary up and coming creator, Jin Chan Yum Wai. This confidant charming concept about not just a thief but a KING of thieves who had ALREADY conquered everything he was seeking -- was a SUPER FUN read. We were equally excited that the series featured a CHINESE HERO. Saturday AM's strength is in producing strong original manga work that is DIVERSE and it was with great JOY that we learned that Jin was going to continue the unique series EXCLUSIVELY within Saturday AM! While Jin was wrapping up a SUCCESSFUL KICKSTARTER for his 1st title, HIGH SCHOOL ROMANCE, we were able to steal a few minutes from him to answer questions with him about the ONGOING SERIES beginning within Saturday AM issue #89 (the continuation of our #summerofmanga). 4 QUESTIONS with XERO creator: JIN!! 1. What did you like and dislike about the XERO pilot chapter now that you can look back on it? A: I'm mostly really happy with the original XERO short story. Since it was very different from my previous comics work, I was trying different storytelling techniques and pushed the camera angles as far as I could go. My biggest regret is probably the lack of characters, if you include Bag there are only 3 characters, but this was a decision mostly to keep the story as small as possible and be able to hit my deadline. 2. The character really struck a nerve with people loving his design as well as the character of BAG. Can you tell us what your inspirations were with both XERO and Bag in terms of the design? A: Xero's outfit was inspired by some clothing that martial artists wear back in ancient China, the character that appears on Xero's back is “零” which is the Chinese character for the number zero. Xero's devilish appearance comes from the fact I wanted him to look "cool". The cool look is usually designated to the Vegeta/Sasuke type character and I just wanted the main character to be the "cool" one. Bag originally looked like a cute simple round monster with bag straps, but after looking at one of my own bags I realized there were cool ways to depict emotion using the bag flap, so I made him look more like a regular bag. 3. What do you hope the series can accomplish now that it will run regularly in Saturday AM? A: World Building. That's the big one. I want to flesh out the world of Xero so it feels alive and well thought out. The other thing is FUN. I want this series to be fun, and hopefully, keep you smiling ear to ear. 4. What can you tell us (tease) about the plot for this new series? A: The series will kick off with Xero trying to find a solution to his Bag problem, though as you can imagine there will be struggles along the way. You will also start seeing more of the world of Xero, we will meet new characters and some from Xero's past which was hinted in the original short. There will be lots of action, adventure and most importantly fun! I hope everyone checks it out and enjoys the ride. The official home of XERO: KING OF THIEVES, the all-new Chinese shonen webcomic by Jin Chan Yum Wai! READ and BUY OFFICIAL MERCHANDISE from Saturday AM!